Did some installer bury your favorite program deep in the Start menu? If you know the name of the shortcut you can search for it with Windows Find File, but some shortcuts are named, well, oddly. What can you do? Here's a simple answer- Find Shortcuts. 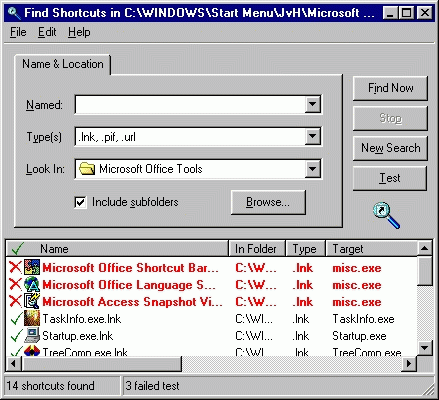 It looks a lot like Windows Find File utility, but searches only for shortcuts. For those it finds, it shows the information in the shortcuts controlling which program will start and how it will run. Just as in Windows, you can move, copy, rename, or delete them. Unlike the Windows version, you can test the shortcuts to see if they will work correctly. Make your Start Menu convenient for you, not some installer!